Hope for Youth is a registered NGO (Non Governmental Organization) in Uganda. that provides support services to the underprivileged children and youth of Nama Sub-county in Mukono District and to their guardians, the majority of whom are Grandmothers. They currently run a Primary School (Nursery to P8) for children who cannot afford to attend the local government-aided schools. Over the years, CanAssist has had a close relationship with the Hope for Youth School. Canadian supporters have helped construct a well, rainwater catchment system, new classrooms and new latrines. 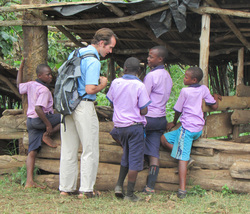 Supporters have visited the school on many occasions and always receive a warm welcome. Teachers are paid a meagre salary and often have to come from other villages. When they stay in the community they have to find accommodation. This is a common problem in East African schools. Hope for Youth wanted to construct a building to serve as housing for teachers. This would help them to both attract and retain qualified teachers for the school. The community gathered locally made bricks for this structure and CanAssist supporters across Canada donated the approximate $10,000 required to initiate this project. We are delighted to report that the teachers' accommodation building is nearing completion in September 2015. Peter Nsbuga explains the need for teachers' accommodation. houses (normally two rooms) for their teachers so that they can settle. to demand for rent fees. teachers will be attracted to stay with us." Sand fleas that burrow into feet causing painful egg cysts to develop on the soles were a problem for the students at Hope For Youth School. Read how CanAssist supporters were able to help solve this problem here. If you would like to help Hope for Youth School through CanAssist, designate your gift to Hope for Youth - either with a check to CanAssist African Relief Trust, P.O. Box 1385, Kingston, Ontario. K7L5C6 or by donating online using a credit card through the secure Canada Helps link below.